Looking for a unique Web surfing experience? Maybe it's time to try something different with the Maxthon browser. The Maxthon browser provides every internet user a rich experience in online browsing with a set of features that was created to truly impress. Improve your online experience with this Maxthon product that will surely fail to disappoint! 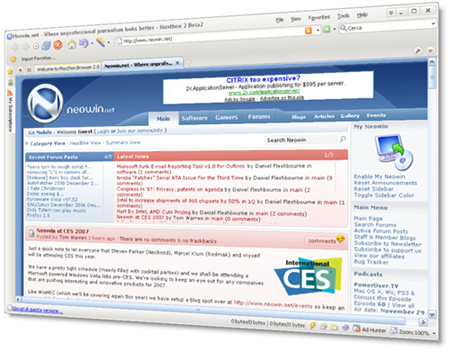 This browser is actually created after Microsoft's Internet Explorer (IE) engine. Although it is only starting to gain a small following in the West, in the East (mainly in China) the use of the Maxthon browser has caught on tremendously. Browse the internet with confidence and ease as you try out Maxthon's Smart Acceleration which improves your browsing speed dramatically when you browse the sites that you often visit. With the Magic Fill feature, fields are easily filled in by the browser with existing information that you usually use when you are online. The Online Favorites Service will also allow you to access the content of your favorite sites which saves the same in a file format that is encrypted to protect privacy of individual users on a computer that is shared. Comparable to Firefox in terms of plugins, the plugins that it accommodates comes up to over 90 percent of what Firefox already has. The nifty Drag-and Drop feature of Maxthon is something of a novelty as it allows the user to select certain keywords and drag the same keywords to the address bar or onto an open webpage. What makes it an even more innovative choice is the ability for customization of the Maxthon browser to your own personal specifications. Its default design is already one that is attractive and easily navigable, but the customization options are quite pleasing. First and foremost, you can install the plugins of your choice which makes surfing much more enjoyable and smooth. But the customizable skin feature is one thing that has many users raving as you can customize the browser's look according to your desires, and you can even design one yourself! There are at least 19 languages for the language packs which is drawing in community users at international proportions. Most importantly the Filter Packs allow you to modify web page source code and take away ads on certain websites or perform special features. This is great when there are specific content formats and pop-up ads that you want to avoid. A most useful addition to this Maxthon browser version is the Baidu Suggest. The Baidu Suggest will basically correct a crash problem in instances when the user opens certain files. Other security features like the Trusted Website Check will help the user secure online transactions by displaying the Trusted Site icon and color green in the URL bar whenever the surfer goes onto a site that is often visited, used, and trusted. The Clean Private Data option also clears your browser information according to your specified settings, which is most useful on shared computers. The Security Updates of Maxthon will also prevent the threats of specific IE vulnerabilities while you surf the internet. The Maxthon features are certainly proving to be straightforward, easy to manipulate, speedy and compact which are things that are becoming more attractive to netbook and laptop users. Maxthon is one piece of online software that will surely catch the attention of avid Web users everywhere because of its competitive edge, intelligent features, and updated design. Maxthon Free Download - we do not host any Maxthon torrent files or links of Maxthon on rapidshare.com, depositfiles.com, megaupload.com etc. All Maxthon download links are direct Maxthon download from publisher site or their selected mirrors.